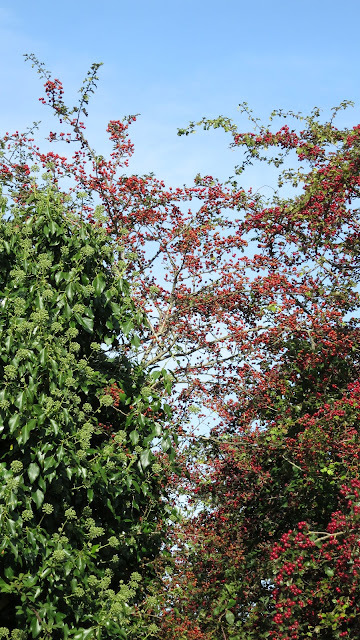 LOOSE AND LEAFY in DORSET: HAWS! I knew it, I knew it. Come autumn, I'd lose balance. All is everything. Thistle down everywhere. New leaves, new flowers, popping up by surprise. Ivy buds are silhouetting themselves against the skyline. They are making stars in the foreground. 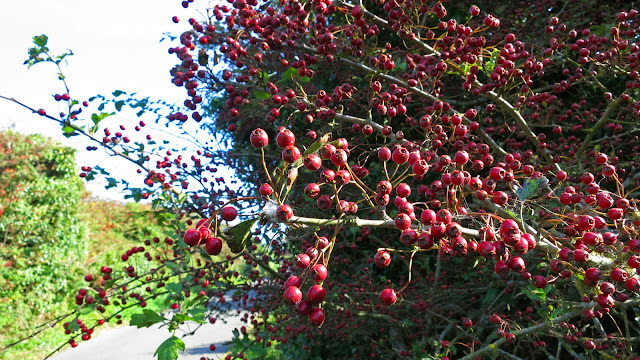 Christmas is already there in the hedgerows. 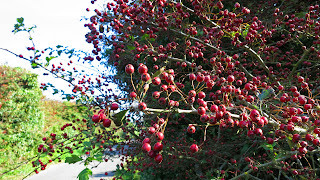 Why wait for holly berries to ripen? We are blasted by haws. One is always surprised by latecomers. 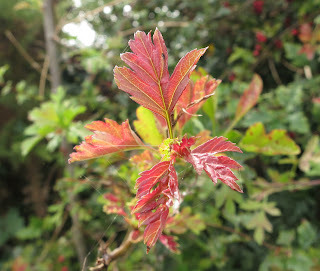 There are always some - like these new hawthorn leaves. I couldn't choose between them. We'll have have them all! For this one - haws. I didn't discover spring till my camera revealed it. Flowers and (the almost obligatory) hoverflies - and berries. Autumn is where it's at. I miss the warmth of summer but the colours of autumn are always so wonderful, those hawthorns look so good. We are so lucky to have the different seasons to appreciate the changes. Like your new top picture. Very atmospheric. Hello Down by the Sea - the gradation between seasons is more noticeable here than in other places I have lived - though the seasons themselves not as far apart. We have blue skies and sun in winter - not northern rain! Thanks Janet. I'm pleased with the new header. I took it a couple of evenings ago - hence the colour - and the plants are a good representation of what plants grow here and what they are like at present. That's a smashing header Lucy, beautiful. There seem to be more Hips here than Haws. I delved into a Haw yesterday and was surprised to find just one seed inside, I thought that they would be like Hips! I also really like your new header photo -- great mix of sky/clouds and earth/plants. And I like the autumn feel. Oh I love your blog! Just found it today but I am a new follower! Love your photos :) Makes me miss England! Berries, do we have the same kind of Hawthorn that you do? Little tiny rosettes of flowers? Really cute, rest of the season not much interest. I like yours way better. Hello Toffeeapple. Glad you like the new header. I'll need to go and see what the hips are like. There won't be as many as haws - I imagine for the very reason that hawthorn takes their space and blocks their light - but there are a few places where I can expect to find them. Hello Donna. It's funny, isn't it - that autumn always comes as a surprise, however many we live through. Hi, Mark and Gaz. It will be interesting to see what colour we get in the leaves here. Many are simply curling up from the edges, dry and brown on the trees - as if they have been singed from below by bonfires. Hello Brianna. I'm glad you have found Loose and Leafy - and that you like it! Hello Jen. There are (and I only discovered this recently) several kinds of hawthorn so I imagine some are more interesting than others. It's very pretty in spring - with the trees covered in blossom. Some is pink and some is white. Although the blossom, to my eyes, is not as pretty as blackthorn, the leaves are beautiful - light green and slightly oak-like. I like them a lot. A while back, I got in a muddle with how labels worked and took a whole load away - which means I was going to give you a link to a hawthorn blossom post but can't find it. I'll have to do some housekeeping on the blog! Hello Rhi. So glad you like Loose and Leafy. More posts coming up! You might like to know there's a new Loose and Leafy post on the blog.